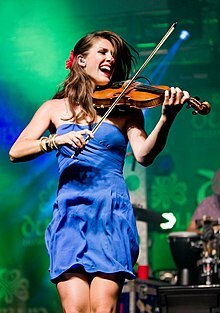 Kiana June Weber is an American violinist, best known as a former member of the Irish band Gaelic Storm. Weber was born near Chelsea, Michigan to her parents David Weber and Connie Weber. In 2007 she graduated from Chelsea High School. She later graduated from University of Michigan’s School of Music. Kiana Weber started her career with a Celtic band called The Chelsea House Orchestra. In 2009 Weber joined the Canadian violin troupe, Barrage. She toured with Barrage for three years and appeared in theaters, festival stages, and television specials in North America, Central America, Europe and Asia. Weber joined Gaelic Storm in the fall of 2012, and played on several albums, including Go Climb a Tree. Weber left the band in the summer of 2017 and was replaced by fiddler Katie Grennan. She played fiddle in the band of the 2018 U.S. touring production of Come From Away. Kiana is married to Martin Howley, banjo player for the Irish celtgrass band We Banjo 3. ^ "Kiana June Weber : Formidable talent". Ann Arbor Observer. December 2013. Retrieved Sep 21, 2015. ^ a b c d "About Kiana Weber". Official page of Kiana Weber. Retrieved September 21, 2015. ^ a b "Kiana Weber Interview". Chelsea Library. 2011. Retrieved Sep 21, 2015. ^ "About - Katie Grennan". Gaelic Storm. Retrieved 4 September 2017. This article about a rock musician from the United States is a stub. You can help Wikipedia by expanding it.